They Walk. They Talk. They Kill. A precocious girl, her nasty parents, two punk-rock losers and a weak-kneed salesman inadvertently become the guests of two ghoulish senior citizens in their dark, haunted mansion. The old couple makes and collects dolls that, when not sitting still like good little mannequins, creep around in the night, offing the guests one by one! You may laugh at first, but if they turn on you, you’ll regret it...for the rest of your short life! 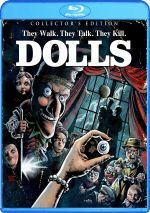 Not long after his cult success with 1985’s Re-Animator, director Stuart Gordon returned with another horror experience, 1987’s Dolls. During a storm, David Bower (Ian Patrick Williams), wife Rosemary (Carolyn Purdy-Gordon) and young daughter Judy (Carrie Lorraine) take shelter in a nearby castle. Along the way, the nasty Rosemary throws her stepdaughter Judy’s beloved teddy bear into the woods, an action that sparks the child to imagine the actions of a giant vengeful beast. Snapped back to reality, the Bowers meet the castle’s residents: Gabriel Hartwicke (Guy Rolfe) and his wife Hilary (Hilary Mason). Before long, three more visitors arrive in the form of American tourist Ralph (Stephen Lee) and sleazy punk rock girls Isabel (Bunty Bailey) and Enid (Cassie Stuart). Gabriel makes elaborate dolls, and he gives one to Judy. Gabriel tells her that toys come to life at night when their owners sleep. In the case of his creations, this turns out to be true, and we observe the events that follow this revelation. It’d be easy to see Dolls as little more than a bloody cousin to 1995’s Toy Story, but I think it gives us more than that. Of course, neither Dolls nor Toy Story invented the notion of “toys come to life” anyway, and they give us substantially different experiences. Ironically, the live-action Dolls comes across as more cartoony than the animated Toy Story. Though billed as a horror film, it’s more of a fairy tale with gore elements thrown in along the way. Those can seem gratuitous, honestly, and don’t serve the story all that well. Dolls lacks the heart and fine characterizations of Toy Story, but I don’t view that as a bad thing, as the older film doesn’t aspire to be much more than what it is: a fun little romp. At 77 minutes, the movie concludes barely before your Blu-ray player has gotten warm, and I think the flick’s better for its brevity. The story doesn’t offer much more than a variation on The Old Dark House with the doll-related twist, so characters stay thin and one-dimensional. Normally I complain about that, but I don’t mind in a story like this. The tale exists to set up some supernatural shenanigans, and it does so in a satisfying manner. Even with predictable elements, the plot unfolds in an enjoyable way and becomes more fun when the mayhem eventually ensues. Dolls definitely fares best when it involves its title characters. We don’t get a ton of segments that use the dolls come to life – clearly the effects work involved limited these opportunities – but the movie makes the most of these scenes. When we see the stop-motion dolls, they’re a delight and they add a lot to the experience. At no point does Dolls threaten to become anything more than a silly piece of fun, and I’m fine with that because it achieves its goals. I could nitpick some aspects but I think the overall package entertains enough to make me happy. Dolls appears in an aspect ratio of approximately 1.78:1 on this Blu-ray Disc. The movie came with an inconsistent transfer. Sharpness offered one of the strongest aspects of the image, as the film provided mostly positive delineation. A few slightly soft shots materialized, but the majority of the movie seemed accurate and concise. I witnessed no issues with jagged edges or moiré effects, and no signs of edge enhancement occurred. I didn’t sense the use of digital noise reduction, but source flaws became a consistent distraction, as the movie suffered from a mix of specks, marks and blotches. While some parts of the image looked worse than others, I still found more print problems than expected. Colors were good. The film brought us a pretty natural palette, and the hues came across as fairly peppy and full. Blacks were reasonably dark and tight, while shadows seemed smooth and well-delineated. Really, without all the print flaws this would’ve been a very satisfying presentation, but the prevalence of marks and debris left it as a “C+”. In addition, I thought the movie’s DTS-HD MA 5.1 soundtrack came with ups and downs. On the positive side, Dolls offered a broader than expected soundscape – at least in the front. Surround usage seemed to be minimal, but the forward channels provided a pretty good sense of space and place in terms of effects. The mix also attempted localized speech, but that side of things worked less well. Rather than appear to placed in certain spots, dialogue felt more like it bled to the other speakers. The stabs at localization came across more like poor integration than appropriate placement. Audio quality also appeared inconsistent. Speech was always intelligible and usually pretty natural, but some stiff, flat lines could emerge. The same went for effects, which varied between acceptably robust and moderately bland. Music demonstrated the best reproduction, with nice clarity and range. The mix of highs and lows meant this became a “C+” soundtrack. When we shift to extras, the disc gives us two separate audio commentaries. The first track comes from director Stuart Gordon and writer Ed Naha, both of whom sit together for a running, screen-specific chat. They discuss the film’s origins and development, cast and performances, story/characters, sets and shooting in Italy, toy design and effects, and connected areas. Though enjoyable, this becomes a spotty commentary. While we get a reasonable amount of information about the movie, the track tends to sag at times. Still, Gordon and Naha make it entertaining, and there’s enough useful material to sustain the listener. For the second commentary, we hear from actors Carolyn Purdy-Gordon, Stephen Lee, Carrie Lorraine and Ian Patrick Williams. All four sit together for a discussion of cast, characters and performances, sets and locations, working with others and general thoughts from the shoot. As inconsistent as the Gordon/Naha commentary may be, it’s a classic compared to this bland chat. The actors occasionally throw out interesting memories, and Lorraine gives us a few intriguing insights into life as a child actor. Unfortunately, most of the piece lacks good material and this results in a dull, plodding track with little merit. Called Toys of Terror, a documentary runs 38 minutes, 22 seconds and includes info from Gordon, Naha, Purdy-Gordon, Williams, producer Brian Yuzna, executive producer Charles Band, and special makeup effects artists Gino Crognale, John Vulich and Gabe Bartalos. “Terror” looks at the path to the film’s production, story, script and characters, cast and performances, doll design and various effects, sets and shooting in Italy, themes, and thoughts about the final product. “Terror” echoes information heard during the Gordon/Naha commentary at times, but it expands issues reasonably well. I can’t call this a great documentary, but it becomes a mostly good overview. Next comes a Film-to-Storyboard Comparison. This runs eight minutes, 21 seconds and shows three sequences: “Teddy’s Revenge”, “Rosemary Takes a Dive” and “Punch’s Little Secret:”. These clips display the movie in the whole screen with an inset image of the storyboards in the lower right. The presentation offers a nice view of how the original planning art translated to the film. Within a Still Gallery, we find 49 images. These let us see advertising as well as movie elements. Nothing stands out as memorable, but it’s a decent collection. 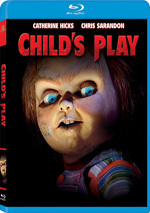 The disc ends with a Trailer for Dolls as well as More from Scream Factory. That area presents ads for Pumpkinhead, Phantom of the Paradise and Sleepaway Camp. While not particularly original, Dolls offers an entertaining piece of work. Its giddy twist on fairy tales and horror turns it into a lively, brisk tale. The Blu-ray presents mediocre picture and audio as well as a moderately informative set of supplements. I can’t call this a great Blu-ray, but I do enjoy the movie.